DYCODE – Clemens Puppe: "Majoritarian Stable Societies"
Arrow’s famous impossibility theorem shows that all collective decision making procedures on an unrestricted domain of citizens' preferences are subject to significant difficulties and paradoxes. A well-known instance is the `Condorcet Paradox´ which exhibits cyclical majorities. On the other hand, in the context of specific problems and questions individual preferences may have additional structure that allows one to consistently aggregate them into a collective preference. In my talk, I characterize the domain restrictions that enable a society to consistently base its decisions on simple majority rule. 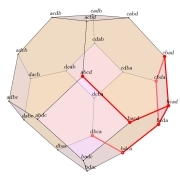 The underlying geometry can be described in a simple and unified way in terms of `median graphs´. Examples are the single-peaked domain, the single-crossing domains and the domain of group-separable preferences; other examples have a less regular structure. For small numbers of alternatives, a full classification will be presented.